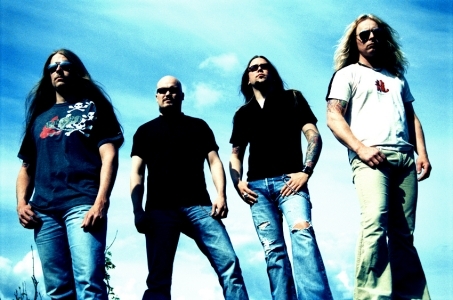 HELLFUELED was formed 1998 by Jocke Lundgren, Kent Svensson, Andy Alkman and Henke Lönn in Huskvarna Sweden. This little town is mostly known worldwide for its motorcycles and chainsaws…and some bands like The Cardigans and HELLFUELED of course! In 2003 HELLFUELED signed with BLACK LODGE and recorded their debut album “Volume One” at Studio Fredman Gothenburg with masterproducer Fredrik Nordström (In Flames, Hammerfall, At The Gates, Arch Enemy, The Haunted, Dimmu Borgir). This would turn out to be a great friendship between Mr Fredman engineer Patrik J and the band. After releasing “Volume One” the band got the chance to be Special Guest on reunited Swedish rockers EUROPE´s Scandinavian arena tour 2004. HELLFUELED also played some great festivals across Europe and received many Album Of The Year and Best Newcomer by a lot of the big metal magazines. In spring 2005 the band once again teamed up with producer Fredrik Nordstrom and Patrik J at Studio Fredman to record Born II Rock. The album went the same way as the first CD and received lots of good reviews all over the world. HELLFUELED once more went Album of the Month in Rock Hard Magazine Germany and so on. In October/November the band did a European headlining tour and played clubs all over Europe. 2006 continued with HELLFUELED playing some of the biggest summer festivals in Europe like Wacken Open Air, Gods Of Metal, Bang Your Head together with some of the biggest bands around. In November/December 2006 HELLFUELED locked themselves in at the new Studio Fredman to record MEMORIES IN BLACK. Fredman is now located in the woods outside Gothenburg so the band lived and breathed this album NIGHT and day for a couple of weeks.The result is the most slamming, hardhitting groove piece coming out so far by HELLFUELED..this is just the beginning!